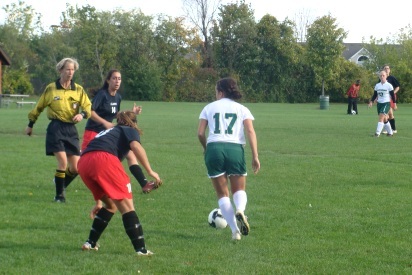 DETROIT, MI–The Mustangs hosted the Cardinals of Concordia University on Wednesday afternoon. The matchup would be one week after the Mustangs upended the Cardinals on their home field, 1-0.
Who would have thought? Who could have imagined a first year team to be fighting for a playoff spot in their inaugural season? Well, now is the time because the Mustangs are right in the middle of the playoff picture as the season begins to wind down. The Mustangs entered Wednesday’s game with a 4-3-1 record and a #4 ranking in the USCAA National Coaches Poll. The top eight seeds at season’s end advance to Vermont for the USCAA National Championship Tournament. A win against a tough Cardinals squad would only strengthen the Mustangs case as they seek an invitation out east this November. The game began with both teams jockeying for position near midfield and looking for any and all opportunities to punch something through for an attack. The Cardinals would strike first with a barrage of shots that freshman goalkeeper Shana DeVoe turned away. A defensive lapse would leave DeVoe facing a 2-on-1 attack as Concordia snuck past the first goal of the game at the 30-minute mark. A second half stalemate thwarted both teams’ attack as they battled to a (1-1) tie at the end of regulation. DeVoe (10 saves) came up huge once again for the Mustangs as she turned away two breakaway opportunities for the Cardinals in the second half. The game would head to a sudden death overtime with the score knotted up, 1-1. The overtime period ended in a (2-1) victory for the Mustangs when freshman Amber Williamson put a well-placed Karlee Derrick assist in the back of net. The hard-fought affair ended one minute into the overtime period and lifted the Mustangs record to 5-3-1 on the season. The Mustangs look to continue their roll when they hit the road to take on USCAA rival, Rochester College. The Warriors from Rochester currently rank #6 in the USCAA and are looking to play spoiler to the #4 ranked Mustangs in the showdown between two of the top six teams in the country. Wear your Mustang Green and catch all the action at Ultimate Soccer Arena in Pontiac this Saturday at 12pm.